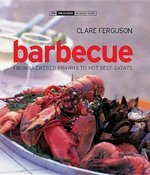 Clare Ferguson has created over 40 recipes for outdoor eating, whether you are planning a grand barbecue at the beach or an informal light meal cooked al fresco. Here are dishes inspired by world cuisines, including soups and salads which can be prepared at home, and delicious fish and meat recipes to cook over hot coals. Fresh fruity drinks, wicked cocktails, and indulgent desserts are all part of the mouth watering selection on offer. Cooking in the open air adds an appetite-arousing, smoky savor--and a sense of adventure. Along with these delicious recipes you will find ideas for marinades and rubs to give your fish or meat a piquant flavor and tenderness, and tips on the equipment that you can use to make your outdoor feast easy to prepare and carry. This book will give you ideas for that perfect outdoor feast in summer or winter. Barbecues, by their very nature, involve primal sensations: heat, light, the gorgeous smell of sizzling snacks. This book takes readers through the equipment they need, the fuel and charcoal, and the amazing appetizers, starters, meats, vegetables, side dishes, and desserts that can be prepared on a grill.